Choose one fruit or make a medley of whatever is in season. Preheat the oven to 400°F (200°C). Lightly butter an oval 6-cup (1.5-liter) ovenproof dish. In the bowl of an electric mixer, beat together the honey, liqueur (if using), egg whites, egg yolks, sugar, vanilla extract, and almond extract. Slowly beat in the flour, then add the yogurt and salt and mix together well, but gently. Spread the fruit and the softened apricots in the baking dish. Pour the batter over the fruit and place on the upper rack of the oven. Bake for 30 to 40 minutes, until golden. Place a doily over the top of the dish and sprinkle with confectioners' sugar to decorate, if using. 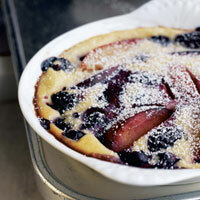 Variation: Sprinkle 1/2 cup sliced almonds over the clafouti after it has been in the oven for 15 minutes. Homemade Apricot Sauce: Chop 6 dried apricots and soak them in 1 cup (240 ml) water for 1 hour; puree to serve as a fruit sauce over the clafouti.